We took a gamble today heading into the back country as heavy rain had recently fallen . I had some small spring creeks as a back up but hoped the main river would fishable in places as i knew it was holding some good fish . The forecast was good early on with winds staying light during the morning but getting stronger as the day went on. We arrived at the chosen river to find it very high and coloured , much more than I had expected it to be , we decided to try the main river first and target the sections where the small clear spring creeks entered into it. Randall fishing the junction where a small spring creek merged with the main river flow ... a hot spot for fish avoiding the brunt of a flooded river. Angus into a good fish we found sheltering in a small stretch of clear water just off to the side of the main flow , the wind had really started to blow by this stage so we changed tactics and began to swing some big streamers down and across with some great results ! Boom ! A streamer eater for Angus , this fish was hugging a bank along a deep bouldery edge . 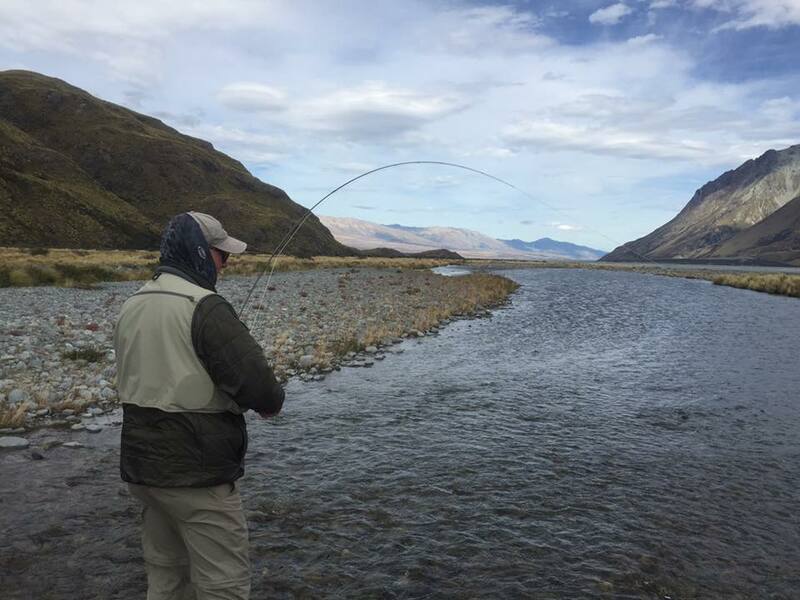 When fly fishing here in New Zealand you quite often need to change your approach and adapt to the conditions to get results , and you must be prepared to use what ever technique's are required on the day , get out and practice your casting before you arrive here in New Zealand !